Tegoroczna edycja Leadership Symposium i jej temat przewodni: Dziedzictwo/Przemiany/Wartości (Heritage / Transitions / Values) wpisuje się także w potrzebę dyskusji o roli artystycznego szkolnictwa wyższego w Europie. W kontekście zmian w polskim systemie edukacji, niesłychanie ważna okazuje się potrzeba podejmowania najistotniejszych dla edukacji kulturalnej tematów. Uczestnicy sympozjum będą starali się odpowiedzieć na pytania: czy dziedzictwo, rozumiane jako system wartości i norm, na którym opierają się uczelnie artystyczne, jest nadal aktualny? Wydarzeniu towarzyszy konkurs na plakat skierowany do studentów UAP, którego wyniki zostaną ogłoszone 30 listopada. Wystawę konkursową można oglądać w Atrium UAP do 5 grudnia 2017 roku. From 29 November to 1 December 2017, Poznań will host almost 60 rectors and representatives of art universities around the world. This is the first time in history that the European League of Institutes of the Arts (ELIA) has organised a Leadership Symposium in this part of Europe, with particular emphasis on the participation of guests from Poland and the surrounding region. Earlier editions of this event took place in Los Angeles, London, Hong Kong, Zurich, Vancouver, Helsinki and Cape Town. ELIA was founded in 1990 as an initiative of the European Commission. It operates, however, as an independent body with approximately 350 members representing university authorities from 49 countries. Universities affiliated to ELIA educate professionals in all arts disciplines. This organisation was established to continuously strengthen the position of artistic education at university level, promote arts education and the role of culture as a central factor in social and economic development, as well as encourage cultural diversity and intercultural communication. For over 25 years, the organisation has been creating a platform for discussion and cultural exchange at a world level. 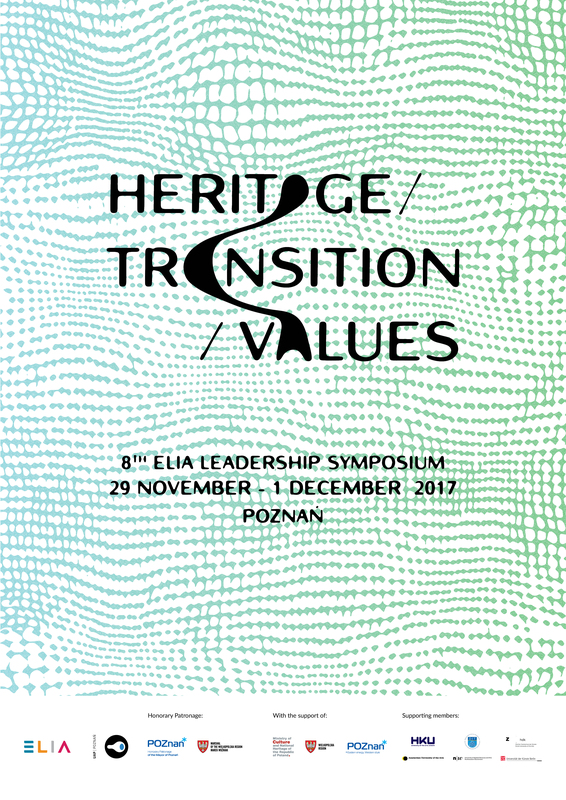 The programme of the 8th Leadership Symposium, whose theme is Heritage/Transitions/Values, includes speeches and panel discussions that will enable co-operation and the exchange of ideas between ELIA institutions. This year’s edition of the Leadership Symposium will ​​contribute to the discussion about the role of higher education in Europe. In the context of changes in the Polish education system, it is extremely important to discuss subjects that are of significance for cultural education. Participants in the conference will try to answer the question of whether legacy, understood as a system of values ​​and norms governing art universities, is still valid. The symposium will be accompanied by a student competition for a poster design related to the theme of the event. Conference participants will select the winning works, which will be presented at an exhibition in the Atrium of the UAP and published in the conference catalogue. The organisers: the University of the Arts in Poznań, the European League of Institutes of the Arts (ELIA), Amsterdam, and the Foundation of the University of the Arts in Poznań. The conference has been organised with financial support from the Ministry of Culture and National Heritage, the City of Poznań and the Marshal’s Office of the Wielkopolska Region.